Home Unlabelled Is Myanmar set to be the next big procurement partner? Is Myanmar set to be the next big procurement partner? Myanmar, a Southeast Asian country formerly known as Burma, remains an attractive prospect as far as the procurement process is concerned. Although the nation is strategically located by the Indian Ocean and has a climate perfect for agricultural production, global labor concerns are preventing enterprises from integrating Myanmar into strategic sourcing plans. 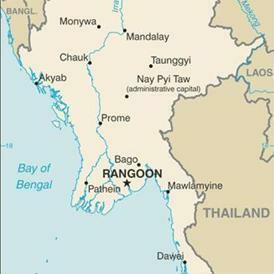 IndustryWeek contributor and ENVIRON Executive Vice President Mark Travers acknowledged the vast amount of natural resources Myanmar has at its disposal, oil and natural gas being among them. The C-level decision-maker referenced a report conducted by the Organisation for Economic Co-operation and Development. "Myanmar is well positioned to engage a multi-pronged development strategy that draws on agriculture, mining and extraction, manufacturing and services," asserted the OECD, as quoted by Travers. What's more, the Asian Development Bank added that the nation's economy could grow from 7 to 8 percent a year for more than a decade. Increasing Chinese labor costs are making Myanmar more attractive to foreign businesses looking to procure cheaply manufactured goods. In response to lifted U.S. and European Union sanctions, Gap Inc. became the first American retailer to produce apparel in Myanmar, according to Foreign Policy. Gap executives claim that the move will keep its global sourcing operations "flexible and nimble." However, there are two risks the apparel brand is taking by setting up shop in the fledgling nation. For one thing, only 30 percent of the 55 million people living in Myanmar have electricity. Secondly, the country lacks a minimum wage law, which has led some critics to speculate that labor abuses could become prevalent. First, it's important for organizations prospecting the country to hire a market research analyst to conduct a thorough, predictive inspection of where Myanmar's economy is heading. For example, will the nation be a solid telecommunications partner in ten years? Or will it be better positioned to satisfy the needs of apparel retailers? With this in mind, organizations should be prepared to develop strong relationships with budding industries within the nation. In addition to keeping up with changing regulations set by global authorities and burgeoning Myanmar standardization, interested parties must pay attention to the financial mindset of the nation's business leaders. Finally, companies should hire procurement services to help them connect with entities already conducting operations within Myanmar. A part of getting familiar with the country is networking with those who have prior experience. How Well is Your Wellness Program? Is Mexico a strategic sourcing nightmare? Is ERP an obsolete spend analysis platform? Is re-shoring a reality or a delusion?